BLOOMFIELD, Iowa (July 19, 2018) — Jon Agan has always been strong at the Bloomfield Speedway, and Thursday was no exception. The Knoxville, Iowa native drove his Dee Zee Manufacturing #4 to a wire to wire victory, collecting $1,500 during festivities at the Davis County Fair. 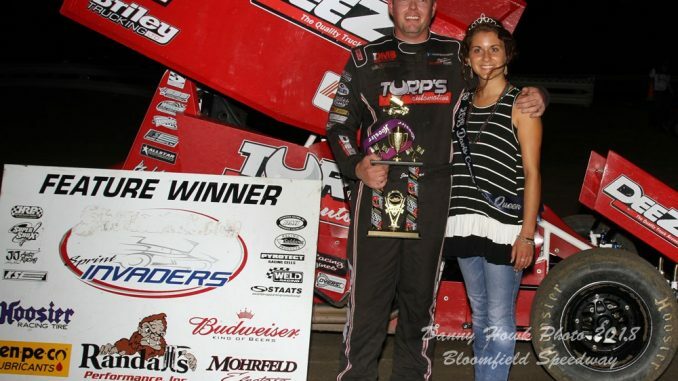 It was Agan’s second career Sprint Invaders win in Bloomfield, and his eighth overall. A number of incidents and mechanical breakdowns plagued the 26-car field. Dominic Scelzi (in Scott Bonar’s #50) and Ryan Jamison suffered early mechanical difficulties. Brayden Gaylord crashed into the turns one and two wall during the Shake-Up Dash ending his night. In the end, six cars scratched before a B main that officials called off due to everyone transferring to the main event. The 25-lap feature saw Agan shoot out from the pole, ahead of Randy Martin, Cody Wehrle, Jarrod Schneiderman and Dustin Clark. Agan entered lapped traffic on the fourth circuit. Clark moved by Wehrle on lap nine, but Wehrle battled back by two laps later. Soon, the leader had lapped up to tenth and then ninth. Agan would tag the lapped machine of eighth place running Sawyer Phillips, sending the Pleasantville, Iowa native upside down. It would prove to be the only stoppage of the event with fifteen laps down. Agan led Martin, Schneiderman, Daneil and Wehrle back to green. Jamie Ball would take fifth on the restart, while Daniel worked over Schneiderman, gaining the third spot with two to go. Agan was gone, however, and won over Martin, Daniel, Schneiderman and Ball. Wehrle, Sammy Walsh, John Schulz, Clark and Evan Martin rounded out the top ten. Wehrle, Schneiderman and Agan were heat winners, and Daniel took the Dash. The Sprint Invaders head to the Dubuque Speedway and the Dubuque County Fair on Tuesday, July 24. For more information on the Sprint Invaders, visit www.SprintInvaders.com or follow us on Facebook and Twitter! After a couple of years on hiatus, the Sprint Invaders will headline the grandstand show this coming Thursday, July 19th at Bloomfield Speedway, during the Davis County Fair. Sprint Invaders A main (started), 25 laps: 1. 4, Jon Agan, Knoxville, IA (1) 2. 14, Randy Martin, California, MO (2) 3. 33m, Mason Daniel, Springville, CA (5) 4. 88, Jarrod Schneiderman, West Burlington, IA (3) 5. 5J, Jamie Ball, Knoxville, IA (7) 6. 40c, Cody Wehrle, Burlington, IA (4) 7. 5H, Sammy Walsh, Orangeville, NSW, Aust. (10) 8. 99, John Schulz, West Burlington, IA (12) 9. 16, Dustin Clark, Agency, IA (6) 10. 4m, Evan Martin, Lohman, MO (9) 11. 3, Ayrton Gennetten, Gravois Mills, MO (20) 12. 81, Tanner Gebhardt, Burlington, IA (13) 13. 69, Justin Buchholz, Davenport, IA (18) 14. 50P, Harold Pohren, Lowell, IA (17) 15. 83, Dave Getchell, Sperry, IA (14) 16. 1st, John Greenwood, Woodward, IA (16) 17. 3P, Sawyer Phillips, Pleasantville, IA (11) 18. 12, Doug Sylvester, Ottumwa, IA (15) 19. 4*, Bailey Goldesberry, Springfield, IL (8) 20. 9, Daniel Bergquist, Burlington, IA (19) DNS – 13, Brayden Gaylord, Wever, IA, 50, Dominic Scelzi, Fresno, CA, 25, Kelly Graham, Hedrick, IA, 51J, Ryan Jamison, Mediapolis, IA, 2D, Dave Keperling, Hannibal, MO, 19, Rob Weuve, Oakland Acres, IA. Lap Leader: Agan 1-25. Hard-charger: Gennetten. KSE Hard-charger: Buchholz.